June 20th, 2017—Food & Friends is thrilled to announce the commitment of a $2 million gift from Fleur, Sidney and Phyllis Bresler, and the Bresler Foundation, Inc. 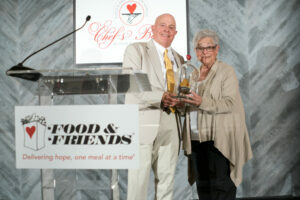 The gift was formally announced last night at the nonprofit’s annual signature fundraising event, Chef’s Best Dinner & Auction, where the Bresler family was honored for their two decades of support for the organization. Food & Friends provides medically-specialized meals, groceries, and nutrition counseling to D.C. area residents living with serious illnesses, working to ensure that anyone who is critically ill has the nourishment they need to manage their illness. The multi-year gift is the largest in the organization’s history and will allow Food & Friends to vigorously invest in capacity for the future growth in order to meet the growing demand for its unique nutrition services. “This generous gift by the Breslers will dramatically leverage our capacity to serve Washington area residents living with critical illnesses in both the near and distant future,” said Craig Shniderman, Executive Director of Food & Friends. In recognition of this transformational gift, Food & Friends’ state-of-the-art facility at 219 Riggs Road NE, DC will be named “The William P. Bresler Building” during a special ceremony in Fall 2017. William “Bill” Bresler was Fleur’s son, Sidney’s brother and Phyllis’ brother-in law. A chef trained at the Culinary Institute of America, Bill was a volunteer in the Food & Friends kitchen and later became a client of the organization. Bill died of AIDS in 2001 and the building will be named in his memory. “Knowing that this gift will enable Food & Friends to sustain their mission for years to come is extremely gratifying. We are honored to have Bill recognized in such a meaningful way,” said Sidney and Phyllis Bresler. Since moving into the building in 2004, Food & Friends staffing has remained largely the same even as the number of clients it has served has increased significantly. From 2005-2015, the number of meals delivered increased by 60% with a more than a 30% increase in clients. Volunteers have more than doubled from 4,000 to over 9,000 individuals annually, while staff only increased by 13% – seven people over 10 years. Having pushed current resources to their maximum productivity, this additional investment will be pivotal as Food & Friends’ advances its mission to improve the lives of people with serious illnesses by ensuring they have the nourishment and support they need to manage their illness. The gift made by the Fleur, Sidney and Phyllis Bresler, and the Bresler Foundation, Inc. will be unique in its local impact. According to the Chronicle of Philanthropy’s online database of charitable gifts of $1 million or more from individuals, only four individual gifts over $1 million have been made to social service organizations based in the Washington, DC metropolitan area in the last two years.